There is a lot to know and like about the homes that are being constructed by the many factory housing builders across the country. When you start to think about it, most homes have numerous factory components including trusses, cabinets, pre-finished floors, railings, tubs/showers, and other items commonly used in today’s homes. The quality, ready availability and the time builder’s save on site make factory components a logical extension of the “site built” products of yesteryear. Whole or half houses are constructed in factories for the same reason. The construction of a fully factory built home is very much like that of a home completely constructed on site. The order of operations may differ as allowed by the factory setting but the results are more alike than different. For instance, interior walls are generally erected before exterior walls and the roofing systems may be built at the same time as the floor/frame systems and walls rather than in traditional sequence of bottom to top. Both factory and site constructed homes are “stick built”, factory built home just happen to be constructed in a climate controlled setting and shipped to a home site. Of the two main types of factory built homes, the most widely used are manufactured and modular. The difference is the code that they are built to. 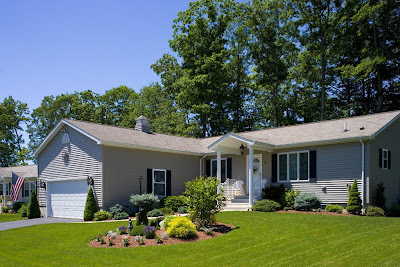 Manufactured Homes are built to the “HUD Code” (otherwise known as the Manufactured Housing Construction and Safety Standards Act of 1976 and as amended). Modular homes are built to state specific codes. When selecting a factory builder, consider the reputation of the builder/dealer as well as the factory. What type of homes does each build (entry level, active adult, move up, luxury, etc.)? Are you satisfied with the options and finishes available? Ask about the building process and how they service warranty items after the sale. Factory built homes are a logical extension of the component building process. When you start learning more, you find out that they have been around longer than you might expect and are located in more places than thought. And that is the beauty. A well built and sited factory home should be indistinguishable from one built on site. We hear all the time how well educated today's consumer is. This is especially true of home buyers. With all of the information available on the Internet, buyers have all the ammunition they need to hit a seller head on. Unfortunately this isn't usually the case with today's seller. Most sellers don't arm themselves with research or objectivity. They are more likely to use "what their neighbors got for their house last year" or "what they need to pay of their mortgage" or what they need for a down payment on their next home" to justify what they "want" for their home. Even an appraisal is just an estimate of fair market value which can only actually be determined when a willing buyer and willing seller come to a meeting of the minds and sign a contract (and actually close) onr a home. So for all you sellers, please do your homework. And please understand that what you want is not usually what you can realistically get. · The freedom of your own home with no one directly above, below or beside you. · The freedom of your own yard to work, play and enjoy. · The freedom from all the responsibilities and heavy lifting of land ownership – Jensen takes care of the underground pipes, shrubs, trees, driveway, water, septic/sewer, and even the land taxes. · The freedom of a smaller and manageable yard that’s a snap to maintain. · The freedom from a large mortgage and financial burden of a large unwieldy home. Many of our customers are “rightsizing” from various forms and sizes of previous homes. Most have owned their own place before and want the benefits of homeownership, but also some of the advantages of community living. They are pleasantly surprised to find the best of both worlds in a manufactured housing land lease community where they can own a generally smaller, well constructed and energy efficient home on one floor but on a cottage size lot. Great neighbors and community amenities are the icing on the cake! Buying a home that is well within one’s financial and physical means allows more time and money to do what you really enjoy. Don’t take a step down; take a step into a rightsized home and the Good Life.